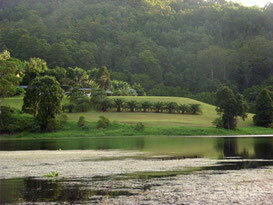 Yandina is one of the oldest towns on the Sunshine Coast. Situated between Nambour and Eumundi and less than 20km west of Coolum Beach, it is centrally located to take advantage of both the Blackall Ranges to the west and pristine surf beaches to the east. The Maroochy River and South Maroochy River wind through fertile farming and grazing land, natural rainforest, parks and reserves, making the area a rural haven. The iconic Australian country town itself and picturesque surrounding area provide visitors with many wonderful places to explore. As would be expected in such an old town, the area is rich in history. Home to the Gubbi Gubbi people for millennia, the first Europeans settled in the area in 1853. Fortunately many old heritage listed buildings in the town centre remain. The most well known of these is possibly the Yandina Hotel, which is the oldest pub on the Sunshine Coast. It was established in 1887 by pioneers as a staging depot between Brisbane and the Gympie gold fields to the north. The Tourist Information Centre in Yandina Historic House (3 Pioneer Rd) offers a Heritage Trail map. The iconic Ginger Factory is one of the Sunshine Coast’s most popular tourist attractions. Home to the world famous and 'best in the world' Buderim Ginger, the park features great shopping facilities, a wonderful cafe set in tropical surrounds, educational tours, fun rides, an undercover playground and walking tracks through beautiful sub-tropical gardens. Sample ginger confectionery and perhaps even buy one of the vast range of flowering ginger plants to take home. Enjoy a leisurely ride in an open air carriage in the historic 115 yr old Ginger Train as it winds through the park. Every January the Ginger Flower and Food Festival provides a feast for the senses and brings crowds from near and far. Entry is free. Costs apply to tours and rides. The Ginger Factory is the perfect destination for the whole family. 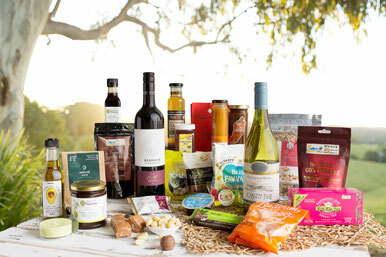 Situated across the road from the Ginger Factory is Nutworks, the Sunshine Coast's own Macadamia factory. Macadamias are actually native to Australia and the area is ideal for macadamia farming. Nutworks supply macadamia nuts in shell, kernel and flavoured nut products and confectionary both nationally and internationally. They have established a well earned reputation for the quality of their products. Make sure you drop by to sample some of their delicious flavoured macadamias and enjoy a coffee and macadamia scone in the Cafe. Every Saturday morning throngs of locals descend on the Yandina markets. An eclectic mix of pre-loved home wares and clothes, second hand tools, fresh fruit and vegetables, locally produced gourmet foods, home made cakes and a profusion of reasonably priced plants of every kind and size, there is always a bargain to be found. Held in the Yandina Sports Complex, North St, Yandina. The tranquil Wappa Dam is fed by the South Maroochy River. An abundance of wildlife make their home in and around the dam. The scenic area contains picnic grounds, bbqs and a playground. Water activities are not allowed in the dam. The nearby falls are small and possibly not running at all in the dry season, so don't expect an impressive, thundering flow of water! There is a deep water hole to swim in, but take note of the signs as it can be dangerous when the water is flowing. 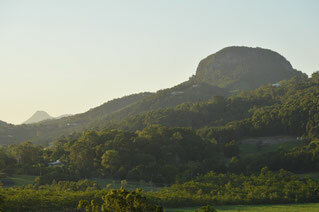 East of Yandina is the well-known landmark of Mt Ninderry. The mountain is an important part of the Aboriginal Dreamtime story involving Mt Coolum, Maroochy River and Old Woman Island. The 5km walk is not difficult and provides great views from the plateau at the top. Follow the directions in this link to find the start. The historical Yandina Station was established as Yandina Cattle Run by the pioneering Skyring brothers in 1853. The current property of over 200 acres still operates as a working cattle farm, making it the oldest cattle property on the Sunshine Coast. Lovingly renovated to its former glory, Yandina Station is now a luxury country estate and unique venue, popular for weddings and corporate events. Luxury private cottages are also available. For booking contact Yandina Station. You know you are on to something special when you have to book weeks in advance for any table on any day at a restaurant in a region filled with quality dining options. Multi award winning, The Spirit House has established itself as a destination in itself. Set in lush tropical gardens around a tranquil pond, complete with Asian decor and serving 'to die for' contempory Asian food, it is easy to forget you are still in Australia. If you love Asian food, this is one feast for the senses you mustn't miss. This is a fun day even if like me, you prefer eating to cooking! Learn the chef's secrets and master techniques to make amazing dishes while you make new friends. Then sit down and enjoy the fruits of your labour with a shared meal and glass of wine in a magical setting. A variety of menus are available to choose from. Visit the cooking school page to view class times and make bookings.